I visited Berlin recently and, wandering around the city, found myself in a geek bookshop. To my surprise I discovered a stand of 40k books in English between My Little Pony comics and Star Wars calendars. All literature I took with myself was already finished by that time so after checking my BL wishlist I picked up a copy of Deathwatch: Xenos Hunters - anthology of eleven short stories devoted to these alien-hunting marines. I thought that, with any luck, some of the stories might contain interesting ideas on the subject as opposed to usual problems that plague SM fiction. So let's see if my hopes were fulfilled. All spoilers are hidden by default. ...their techmarine reaches them with a bunch of gun servitors from a neighboring outpost. After those save the day the marines fly into the sunset, ending the story with thoughts of a main character about the impending Exterminatus that makes totally no sense. So year, the first story is a prime example of the bad marine fiction we come to expect. The story has no real twists or interesting ideas and the characters are as boring and forgettable as the ending. The only unusual feature is the enemy in form of Tyranid-eating kroot, mutated beyond recognition. And even that idea isn't really used at all. Fail. ...they are all getting killed by suddenly appearing Necrons. The last one is taken by Thrazin the Infinite as a temporal statue for his fabulous collection. Combat here is written a little better and the ending is mildly interesting, but the story still doesn't really tell anything about Deathwatch and at the end the plot is still just an excuse to put some combat on paper. No good. ...after an armed walk through the ship they succeed with the mission. The story ends with a conversation between Sigma and an unknown techpriest about the mysterious use of said head. So here's a story that's somewhat interesting to read. Occasional conflicts within the group are shown, and there are even hints about conflicts within Inquisition itself which also adds depth to the story. Story is straightforward, but has some interesting bits, while combat is okay. Good. ...find out it was originally created by a species of mind-eating xenos called khrave and after the attempt to destroy it the drive sends the ship to Armageddon system, the one main character was thinking about from the beginning. After initial surprise the two remaining Astartes prepare to die well. Whoever thought it's a good idea to put two stories with such similar plots one after another definitely needs to think again. Still, while less interesting than the one before this story seems fairly entertaining and readable. Ok.
...after overcoming chaos forces it turns out the one for capture was just a member of Jokaero species. No IW leader ever existed and the Fists' forces were deliberately misled by Deathwatch in order to get their help for the operation. And here's a first story not told from the perspective of Deathwatch. The writing is seriously flawed, author either thinks it's okay to repeat "Iron Warrior" twenty times on each page or doesn't know what synonymous is. Boring battle scenes are made worse by horribly overused opponents. Ending is simple, but surprisingly good in showing the cunning side of Inquisition and ;Deathwatch, who are ready to use any means to achieve their goals. But the impression from the horrid text still remains. Bad. ...inquisitor planned the mission from the very start to end up in destroying the Fastness' perimeter starting effectively a civil war on the planet. Being a Recongregator, he believes in a healing force of a conflict and that after the war ends the planet's regime will change into a healthier one without too severe losses for the riches of the Imperial planet. Annandale uses a very interesting idea that the Deathwatch aren't always the best of the best, but occasionally are just a way to assemble a squad of Astartes for very dirty tasks at hand. Radical inquisitors always make the story more interesting and the surprising ending and general novelty of the events and characters make the story stand out among others. Cool. ...fail to do any real damage and get burned by servitor-manned flamers while the representatives of the Deathwatch watch from the platform above, studying the new foe. Here the Deathwatch is nothing more than scenery for the story, that is basically a autopsy report. But it's a nicely written one and I liked it. The fact that we watch a historic event in a history of Warhammer 40000 as opposed to some local event is definitely makes Fearful Symmetries more interesting. ...they discover that the marines have fallen in combat with a disturbing breed of body-eating xenos. Their repulsivness and uncleanness opens up an Imperium's worldview on xenos to our main character. The story ends as she and the last surviving Deathwatch member together go to the heart of a station for a suicide mission to finally purge the xenos abominations. By that moment she no longer understands what she believes in, but knowing that it's definitely not the Greater Good anymore. This story is written from a Tau viewpoint and it is good enough for even me to like. The main heroine thoughts of whether she should view the Imperium either as screaming fanatics or as beings that have some understanding about the Galaxy that her race lacks is definitely interesting. Nice story, even if it doesn't really has a lot to do with Deathwatch. Parker's second story is also not that original, but nice details of story and characters still manage to make it interesting. The characters occasionally act pretty dumb as is usual for BL marines, but rough nature of Inquisition is shown pretty well. Not bad. ...Kill-Team almost gets wiped out but captain teleports in the last moment to save the day. He supposedly used the forward group as bait to locate the warp gate Archon used. And he hasn't told them about his plan because... their mind could be read to discover his plan or whatever. Year. So here's our plain old bolterporn. Story is virtually non-existent, opponents are stereotypical, ending is outright dumb. Terrible. ...nearly loses his life but gets saved by battle brothers at the last moment. After deciding that the lesson of underestimating one's foes is dealt, the squad leader writes a message to his superiors declaring his duty done and leaving to his Chapter. Taking only four pages, this one isn't really long enough to even be a short story. No idea why it's even here, but okay I guess. So let's sum it up. The stories vary in quality heavily and I can't really say the anthology turned up all that good. But some of the stories are cool from beginning to end and most of others contain at least a nice idea or two. 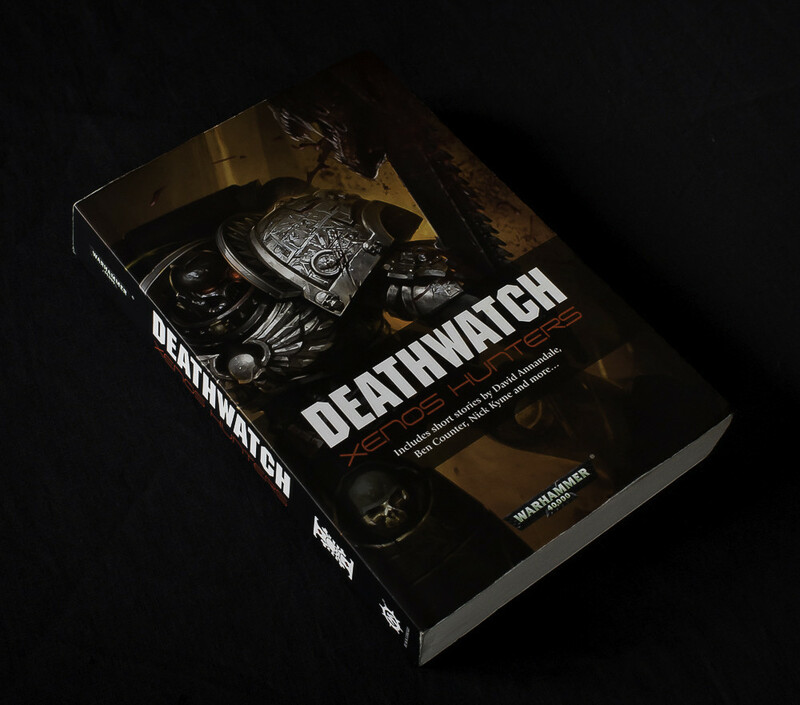 So the ones interested in Deathwatch will undoubtedly find something cool inside which is the point after all. To me in served a good inspiration for the upcoming FFG Deathwatch roleplaying campaign.